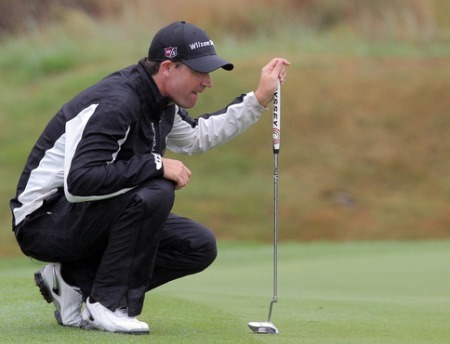 Padraig Harrington grinds on the line of a putt in January’s Volvo Golf Champions. He now admits that he has to try and be less demanding of himself on the greens. 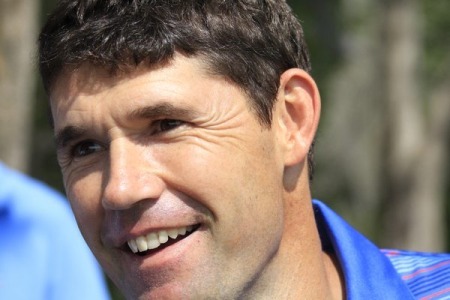 Photo by Carl Fourie www.golffile.ie Padraig Harrington has confessed that his fear of the yips forced him to seek help from Bernhard Langer at Augusta. Whether or not the story will have a happy ending remains to be seen. The triple major winner, 40, admits he had been “putting horrendously for the year and a half” before taking is wife’s advice and seeking to the German maestro - plagued by the affliction not once but four times during his storied career - first thing on Monday at the Masters. Harrington changed the grip on his putter in February (the trusty Two-Ball putter has also been in and out of the bag on occasion) and he could never be accused to lack of perseverance. And he’s praying he’s on the road to salvation again after admitting on a recorded television programme on Sunday that he was “close to the heebie-jeebies on the greens.” Not quite the yips, but not a million miles away. Refusing to even contemplate using the word “yips” - like a superstitious Shakesperean actor who will say “The Scottish Play” rather than Macbeth - Harrington even had words for TV pundit Nick Faldo, who described his putting stroke as “scoopy” on air after the Dubliner had just missed one a hatful of birdie chances in the final round at Augusta National. - noun ( used with a pl. v. ) Slang. 1. a condition of extreme nervousness caused by fear, worry, strain, etc. ; the jitters; the willies (usually prec. by the ): Just thinking about ghosts gives me the heebie-jeebies. In a telephone interview carried out last week, Harrington made it clear that he is happy to announce that he has abandoned the technical route in his line of enquiry. I am a lot happier with my putting now that I realise it is not a technical thing. It is nothing to do with my technique. With many different grips and many different putters, I can put myself up with the best of them and hit putt after putt with less than 10 rpm sidespin, that’s negligible. On Faldo’s analysis, he said: “I know you might have been listening to Faldo talking about a particular putt but I guarantee you, if I made a short follow through or a yippy this or that, it was because I was anxious about the way I had read the putt and anxious about missing the putt. “I’ve had a beautiful putting stroke for a year and a half and a bad attitude. Now I have the right attitude and it works great. The Irish superstar is not doing cartwheels about finishing eighth at the Masters Tournament and knows he needs to win a big event - or two smaller ones - to get back into the world’s top 50. But he is hopeful that he has found the key that will end the constant “worrying” over short putts that has plagued him for the past 18 months. Without a win on a major tour since 2008, he’s crashed to 86th in the world and lies 176th out of 182 for his putting from three to five feet on the PGA Tour this year. He’s tried everything in his power to work out what’s gone wrong but even after changing putters and the grip on his club, it took his chat with Langer to convince him that it was all in his head. He’s obviously been scratching his head searching for a solution. He said: “Of course I was looking for something - I’d been putting horrendously for the year and a half. But I changed it around 100 percent at the Masters. “I had been chatting with Bob Rotella about it for a long time and I think Bernhard helped me confirm more what I had been working on with Bob. I had to accept that I could miss putts. I have to accept that I may miss a putt and accept my reading of the greens. It is a simple as that. The problem came back to haunt Harrington in the final round at Augusta, where he had a slim chance of winning the green jacket but second-guessed himself by trying to be too precise in his reading of the greens. But he’s happy that he at least knows where the problem lies and can’t wait to get back into action to test it out when he returns to action in the Players Championship at Sawgrass next week. Reflecting on his eureka moment on Setanta’s iTalk Sport on Sunday, Harrington came closer than ever to using the dreaded “yips” word. What Mrs Harrington used to threaten her husband is unknown for now. Whatever it was, it worked. “He’s the closest in personality to the way I play golf and he obviously went through his issues,” Harrington said, once again refraining for using the word that dare not pass a golfer’s lips. “Like everything I can go and talk to other people and tell them what to do but sometimes I need to hear it myself and be reminded. “Bernhard explained that for him you have got the have the attitude that you can hole or you can miss the putt. So there has to be a level of acceptance. It goes in or it doesn’t go in. “It’s much more to do with me reading the greens and being confident in my reads and accepting that I can miss putts and not trying to hole everything. It is much more about my outlook psychologically on the golf course. “I did change something technical but that’s neither here nor there, it is much more about my attitude and, you’ve heard it a million times, trusting the reading of the greens and trusting the lines, and accepting that it is okay to miss the odd putt. Getting back to the final round of the Masters, when all Ireland sat on the edge of their seats as he knocked down the pins several times and then frustratingly failed to finish the job, Harrington explained in detail that playing under severe pressure caused him to become hyper careful about the lines he picked. “I didn’t putt as well in the last round but it wasn’t the same bad putting as I had done at tournaments previously. It wasn’t anything like that. It’s always a problem under pressure and anyone in the last round, I got a little bit cautious, not cautious, that’s the wrong word. I analysed the lines too much. I was second guessing the lines and trying to get them right. “Early on in the week I had a bit more feel. I was trusting my feel early on in the week whereas on Sunday I was trying too hard to read the greens. When I look back on the misses in the last round, and I think about it, it is because I was trying to hit - and this will sound very strange because I goes against a huge amount of the way people think you should putt - I putt well when I read a putt and I think I have got to hit it outside the right somewhere. “The fact of the matter is that the hole is four and a quarter inches wide, so you could hit it three inches right or right lip and it will still go in the hole. So somewhere up the right is a good read. I putt badly when I go, I’d better hit this exactly one inch or half a ball outside and I start getting anxious that if I hit it two balls outside I am going to miss and if I hit it on the lip it is going to miss. That’s rubbish. There is a bigger target than you think and when I putt very well I will read the greens generally. “When I putt badly, I read the greens very specifically. But it’s a hard thing not to do. I guarantee you, if you have a putt to win a tournament, you are going to have a second look at it and second guess yourself. It is so hard to walk up there and just go… At Augusta I was so good early on in the tournament because there are a hundred different lines into every hole. It was all feel. What happens next is anyone’s guess but Harrington has not been compared to Langer for nothing. Bloody-minded determination is his motto and mental fortitude his badge of honour. 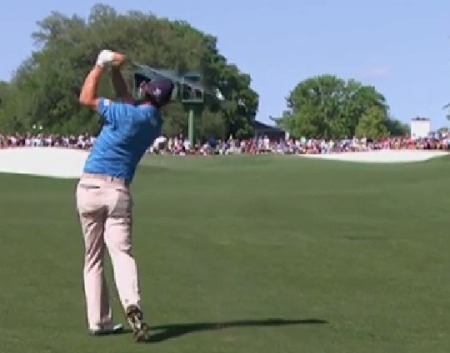 Perhaps Langer wasn’t too far off the mark when he spoke about the power of prayer. A little blind faith wouldn’t go amiss, for Harrington or his many admirers. There's life after the yips for Harrington, so what about Tiger? Pádraig Harrington idolises Bernhard Langer. He overcame the yips three times. He has an incredible work ethic. He always go the extra mile. What he really thinks of Tiger when he’s speaking to his mates behind closed doors is anyone’s guess but having overcome the yips himself to become a winner on the biggest stage again, he sees no reason why he can’t be some sort of inspiration to Woods.